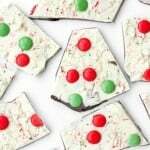 Chocolate and peppermint Christmas bark is the perfect treat this holiday season to enjoy with your family and friends. Melt the dark chocolate until smooth. Pour onto the parchment paper and spread out using a spatula, until it is about 1/3 ” thick. Place in the fridge for 10 minutes to slightly harden. Melt the white chocolate and pour on top of the dark chocolate. Carefully spread out the white chocolate with a spatula, covering the dark chocolate. Sprinkle crushed peppermints and smarties/m&m’s on top of the white chocolate while it is still melted. Place the pan in the refrigerator for 2 hours (or 45 mins in the freezer) until the chocolate hardens. Break the chocolate apart into pieces and enjoy!